Whether you're in the studio, classroom or on the road, our Atelier Clay Modeling Tool Kit is at the ready. Professional sculptors have chosen these tools as their “go to” sculpting implements so you can perform a wide variety of sculpting techniques, including cutting, scraping, shaping and texturing with just 9 tools. Whether you are working in Plastilina, wax, self-hardening clay, moist clay or plaster, these superior modeling tools allow you to move easily from one medium to another. 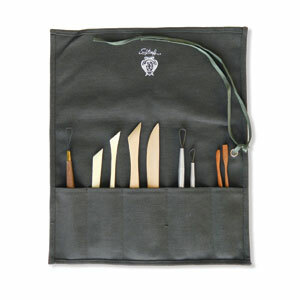 To more easily store and better preserve your tools a canvas roll is included with the set.